Dublin based Kite Entertainment has been commissioned from CBBC for a new science themed for a 13 part comedy series, ‘Brain Freeze’, due out next year. Featuring a blend of puppetry and animation, ‘Brain Freeze’ is the follow up to their previous CBBC/RTÉ Jnr series, ‘Science Fiction’. 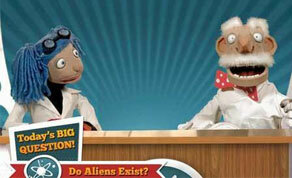 In Brain Freeze, puppet hosts Prof. Mike McCork and Dr. Sorcha Knowles (two of the original hosts from ‘Science Fiction’) will attempt to answer a variety of educational questions assisted by guinea pig floor manager, Colin, and a team of TV robots. Brain Freeze is produced by Colm Tobin who also heads up the writing team of Aidan O' Donovan, Maria O' Loughlin and Damien Owens. The show has been commissioned by CBBC channel controller Cheryl Taylor and will be executively produced byTobin with the BBC’s Hugh Lawton. The series, which has been part-funded by the Science Foundation Ireland and using Irish government tax breaks, will also air on RTE Jnr. Kite managing director Darren Smith said: “For us CBBC is the HBO of kids TV, and RTE Jnr as the original backers of the Professor and Dr. Knowles is their natural home, so we’re really delighted that the SFI funding allows the series to run on both channels”. Kite are optimistic that Brain Freeze can follow the international success of Science Fiction which Aardman Rights have secured deals for across a number of networks and platforms including Discovery Asia and channels in Finland, Israel, France etc. The cutting-edge visuals, mixing 3D animation, puppetry and 2D sketches, will be directed by Ian Benjamin Kenny with Paul Madden on board as compositor and pipeline producer. The original Science Fiction cast of Aidan O' Donovan and Maura Foley will be joined by comedian and actor John Colleary.